It is well known that β blockers reduce mortality in patients with cardiovascular disease. COPD is often complicated by cardiovascular disease and patients are often not treated with β blockers due to concern over possible worsening of airways obstruction, even though cardioselective β blockers have little deleterious effect on airway function. In this issue, Dransfield and colleagues report a study of patients with COPD hospitalised with an exacerbation. The authors show, after correcting for relevant confounders, that COPD patients treated with β blockers have a lower in-patient mortality, than those patients not treated with β blockers. In the accompanying editorial Au summarises some of the reasons for the reduction in mortality observed in this study and concludes that β blockers appear to be safe in COPD. As cardiovascular disease is so common in COPD, Au points out that the effectiveness of β blockers on mortality deserves further study. Pneumocystis colonisation refers to the situation when Pneumocystis DNA is recovered from respiratory samples of patients without Pneumocystis pneumonia. In this issue of Thorax, Davis and colleagues report on some of the risk factors for Pneumocystis colonisation in HIV patients without evidence of formal Pneumocystis pneumonia. The authors found that a high number—68% of patients—were colonised with Pneumocystis, with failure to use co-trimoxazole prophylaxis and severe immunosuppression associated with an increase in the chance of colonisation. However Pneumocystis colonisation was rarely associated with Pneumocystis pneumonia. Telomerase is a specific marker of malignancy and in this month’s Thorax, Targowski and colleagues describe a study of telomerase activity in patients who had transthoracic fine needle aspiration performed for peripheral lung lesions. The authors found that the diagnostic sensitivity, accuracy and negative predictive value of the combination of cytology and telomerase activity assay in fine needle biopsies was higher than for cytological examination alone. Thus estimating telomerase may be useful when the initial cytology result from the needle biopsy suggests no evidence of any malignancy. As Whitsett points out in his accompanying editorial to the paper by Doan and colleagues, study of surfactant homeostasis has provided ongoing insights into the role of surfactant proteins and lipids required for lung function after birth. ABCA3 is an ATP-binding cassette transporter of lipids found in alveolar type II cells and mutations in the ABCA3 gene can result in fatal newborn surfactant deficiency and chronic interstitial lung disease in older children. Doan and colleagues describe the course of clinical presentation and disease in children with ABCA3 mutations and show that the course is variable and open lung biopsy is required to characterise the condition. Although this is a rare genetic condition, it highlights the importance of alveolar type II cells in lung disease. Progression of disease in follow-up biopsies. (A, B) Patient 1 initially had a pattern of variant pulmonary alveolar proteinosis at 3 weeks of age (A), followed by a predominant pattern of non-specific interstitial pneumonitis at 4 years of age (B). Compared with the first biopsy, the second shows increased airspace enlargement with more pronounced lobular remodelling and interstitial smooth muscle, decreased interstitial widening, similar granular and globular proteinosis material, and occasional foci of endogenous lipoid pneumonia (see page 366). 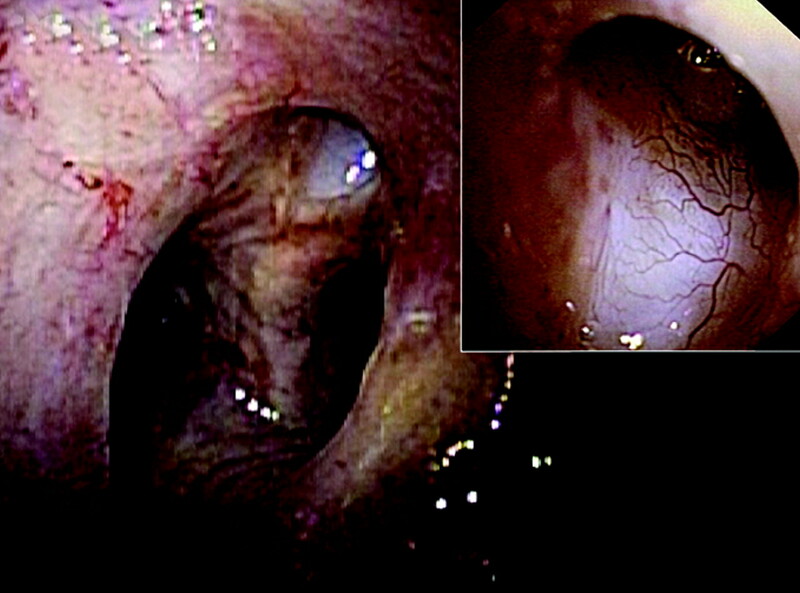 Bronchoscopic image recorded 1 year after cell therapy. The entrance to the fistula was much smaller (diameter 3–4 mm). Inset: the walls of the fistula were covered with “new” epithelium and vessels as a result of neovascularisation and epithelialisation (see page 374).